High quality forages are crucial for the livestock industry. Forages furnish essential energy, protein, vitamins, minerals and fiber. In fact, diets of most domestic livestock consist mainly (if not entirely) of forages. Forage quality varies not only among different forage species, but also within forage species (among varieties). Furthermore, the forage quality of a specific variety can also vary due to field and management conditions such as soil fertility level, diseases/pests control, maturity stage at harvest and storage conditions. For these reasons, evaluating the quality of forages for animal production is a complex task. However, it can be roughly stated that 1) legumes have higher quality than grasses; and 2) adequate soil fertility, low diseases/pests pressure, early harvest and proper storage will increase forage quality of any forage species. The best single measure of forage quality is animal productivity, which is the final goal. To ensure animal productivity, assess and modify the animal diet composition before consumption. Evaluating forage quality is an important practice in the livestock industry. Forages have historically been evaluated on physical factors which include color, leafiness, maturity, smell, softness and purity. These factors are still important in assessing forage quality; but if used solely, they are inaccurate because they are very subjective and difficult to standardize. However, forage chemical analysis combined with physical evaluation results in a reliable forage quality assessment. Direct chemical tests are usually accurate, but are somewhat slow and must be conducted in standard laboratory conditions. During the past several decades, Near Infrared Reflectance Spectroscopy (NIRS) has improved and become popular. NIRS results are highly correlated to direct chemical procedures for most forages when properly calibrated. NIRS units are relatively portable, fast, precise and accurate when properly calibrated. In this fact sheet, there will be description and explanation of forage quality analysis results from the Soil, Water & Forage Analytical Laboratory (SWFAL) at Oklahoma State University, Stillwater, OK. The information provided also can be extended to forage quality analysis produced by other laboratories worldwide. For more information about SWFAL access the link: http://soiltesting.okstate.edu/. Forage quality analyses (using direct chemical analysis, or NIRS) normally measure three different attributes: neutral detergent fiber (NDF), acid detergent fiber (ADF), total nitrogen (TN). Sometimes the concentrations of certain minerals (e.g., calcium and phosphorus) and nitrates are also determined. Other forage quality factors listed in forage analysis reports are calculated from the these measured attributes (Figure 1). Figure 1. Forage Quality Properties Determined by Laboratories. NDF is the whole fibrous fraction (cellulose, hemicellulose and lignin) plus a small amount of silica and minerals that constitute most of the plant cell wall. It contains the slowly digestible and indigestible portions of the plants. For example, 100 pounds of 48 percent NDF forage contains 48 pounds of slowly digestible and indigestible forage, and the remaining 52 pounds contain mostly soluble carbohydrates and will be rapidly digested. Therefore, the higher the NDF, the lower the digestibility, and the lower the forage intake. Therefore, NDF estimates how much forage will be consumed. ADF is a sub-fraction of NDF, composed mainly of cellulose, lignin and a minor amount of silica and minerals. Cellulose is still slowly digestible; however its digestibility varies and is negatively influenced by the lignin content (which is indigestible). Therefore, the ADF is negatively correlated with total digestibility. The higher the ADF, the lower the fraction of digestible material in the forage. In summary, ADF estimates forage digestibility. TN is the total nitrogen fraction in forage plant, including the true protein and non-protein nitrogen. However, the SWFAL forage quality analysis reports Crude protein (CP) instead of TN. Crude protein for forages is simply calculated by multiplying TN by 6.25. Two other measured attributes are Dry Matter (%) and Moisture (%). They are measured simultaneously. A forage sub-sample is dried in an oven at 85 C until a constant weight is achieved. The final dry weight divided by the original wet weight, is the dry matter percent. Percent moisture is 100 percent minus the dry matter percent. The moisture content is an important value for forage storage purposes. As a rule of thumb, hay should be stored in a range of 15 percent to 20 percent moisture. Moisture lower than 15 percent results in leaf losses, decreasing forage quality. Moisture higher than 20 percent results in mold and bacterial decomposition, which not only decreases forage quality but also can provoke spontaneous fire. Silage, haylage and baling contain a higher moisture content; however they must be sealed or wrapped to exclude oxygen and ferment, which preserves the quality. These include Crude protein (CP), Relative Feed Value (RFV), Total digestible nutrients (TDN), and Net Energy (NE) as shown in Figure 1. CP is an estimation of forage protein. Protein contributes energy and provides essential amino acids and nitrogen for rumen microbes and for the animal itself. Crude protein is an important forage quality attribute, but it is commonly calculated from TN, which includes true protein and non-protein N.
Some forages tend to accumulate nitrate (NO3). Nitrate contains nitrogen, and will therefore contribute to a forage’s CP value. However, nitrate isn’t used with the same efficiency as true protein, and is harmful to livestock in high concentrations. A nitrate test is recommended when evaluating nitrate-accumulating forages such as sorghum, sorghum sudan and Johnsongrass, especially when exposed to recent drought, frost and excessive N fertilization. More details on nitrate toxicity can be found in Extension Fact Sheet: PSS 2903 Nitrate Toxicity in Livestock. Finally, there is a false perception that protein is always the most limiting nutrient in livestock diets, and, consequently, CP is considered the ultimate forage quality indicator. In reality, a diet can only produce the desired result when it is balanced, considering all nutrients. The excess of one nutrient will not compensate for the lack of others. TDN is the measurement of the energy value of forages is expressed as a fraction and is calculated from ADF. TDN is an “old” method of quantifying energy. TDN tends to over-estimate the energy value of forages compared to concentrates. Over-estimation may happen because it does not account for additional energy losses such as heat increment and gaseous losses in ruminants. However, TDN is reliable and useful when working with forages. NE is conceptually defined as the portion of the ingested energy that is useful by the animal. Net energy is what is left after losses such as energy in feces, urine, gas and work of digestion are accounted for. Net energy is used for productive purposes such as maintenance, lactation, and growth. • Net Energy-Maintance (NEm): an estimate of the energy value of the forage when used for maintaining the animal in a non-productive state. An animal at maintenance is not gaining or losing weight, not producing any milk nor doing any work on its environment. • Net Energy-Lactation (NEl): an estimate of the energy value of the forage when used for milk production during lactation. • Net Energy-Gain (NEg): an estimate of the energy value of the forage when used for body weight gain once maintenance is achieved. These energy values are often calculated from TDN values which in turn are derived from ADF (Figure 1). The NEm and NEg are often used in balancing rations for growing cattle, and NEl is often used for dairy rations. • A typical cow might require 10.5 Mcal of NEm for maintenance. If fed Hay A, she would be expected to consume about 25 pounds per day, and her maintenance needs would be met (25 x 0.42 = 10.5 Mcal NEm ingested). Conversely, if fed Hay B, she might only eat 20 pounds, and her maintenance needs would not be met. Without supplementation, this cow would lose weight on Hay B.
RFV has no specific nutritional meaning and is used only as an index of the relative value of a forage. It combines the NDF (how much forage will be consumed) and ADF (the digestibility of the forage) into a single number. The RFV index is made relative to the typical forage quality of alfalfa hay at full bloom. If a full bloom alfalfa hay contains about 41 percent NDF and 53 percent ADF, the calculated RFV is 100. The RFV is useful in the market for comparing hays. For example, Hay A and B have RFV values of 110 and 90, respectively. From the RFV values we can infer that, theoretically, Hay A has a 10 percent higher quality and Hay B has 10 percent a lower quality than full bloom alfalfa hay. However, absolute RFV numbers should not be used for making direct comparisons or pricing of forages due to the natural variability of measuring ADF and NDF. It is reasonable to use a range of RFV values (±5 points of the absolute value). This is a more reasonable way to classify a forage (e.g., if an RFV of 130 is desired, any forage with an RFV of 125 to 135 should be considered to have an equivalent value). RFV is widely used because buyers and sellers continue to seek simple means of deciding which hay offers the best quality for the cost. However, the RFV is not useful for balancing rations. For balancing rations, the other quality factors such as NDF, ADF, CP, TDN and NE should be used. 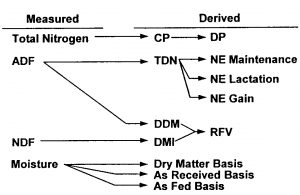 Where DDM and DMI are derived from ADF and NDF, respectively. Different laboratories may use slightly different formulae to calculate DDM and DMI, but final estimated values are similar. = 3.15 % of body weight. RFV = (67.1) X (3.15) X (0.775) = 164. Minerals are essential to ensure proper animal body function. Unlike other forms of nutrients that are required in relatively large quantities, minerals are taken in small quantities. An animal’s growth, lactation and reproductive performance can be compromised if minerals are lacking in its diet. Therefore, the quantification of essential minerals presented in the forage is important for ensuring the animal has adequate mineral supplies. If the forage cannot meet the animal’s mineral needs, mineral supplementation is required. More information on supplementation can be found in the Extension Fact Sheet: ANSI 3010: Supplementing Beef Cows. • A general rule of thumb to help remember forage quality analysis factors is “20-30-40.” High-producing dairy cows need hay with at least 20 percent CP, less than 30 percent ADF, and less than 40 percent NDF. This is equivalent to just over an RFV of 150. Forages with better CP, ADF and NDF values are not necessarily better for milk production. • There is no single way to assign dollar values to forages based strictly on forage analysis. Table 1 illustrates the relationship among various quality factors. These grade classes were developed by the American Forage and Grassland Council and are accepted by many forage buyers and sellers. • Care should be exercised when applying RFV to forages other than alfalfa, because most of the calibration work and formulae for calculating digestibility and intake are currently based on alfalfa hay. Consequently, underlying assumptions may not apply to certain other forages. Another useful index is the Relative Forage Quality (RFQ) which is very similar to RFV. RFQ uses TDN rather than DDM and it is divided by 1.23 rather than 1.29. 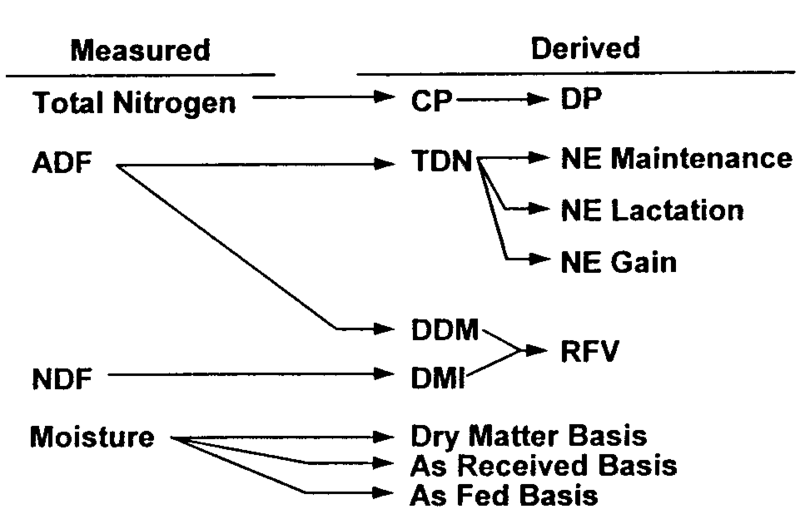 Different formulas are used to calculate TDN and DMI according to the forage type (legume or grasses). • If alfalfa hay with an RFV of 160 is the only forage fed to lactating dairy cattle, then higher RFV’s would have no additional value. However, dairymen sometimes mix very high quality forages with inferior forages to arrive at the desired forage digestibility and intake. In such cases, forages with RFV’s higher than 150 have additional value and should demand higher prices. • When forages are fed to animals in limited quantities, such as supplements for cow-calf herds and dry cows, the importance of RFV changes. The herdsman limits forage intake by providing only a certain quantity per animal, and the NDF of the forage becomes less important. Digestibility (estimated by ADF) and CP are the main quality factors to consider in these situations. • The forage quality results provide by forage analysis can be used for ration balancing. The Oklahoma State Beef nutrition Extension offers the OSU Cowculator which is a free, Microsoft Excel-based computer software design to assist producers in making informed decision associated with beef cow nutrition. The forage quality factors necessary to use the pro-gram are Dry matter, CP (protein), TDN, NEm, NEg, Calcium and Phosphorus. The software is available at: http://beefextension.com/pages/cccalc.html. Table 1. Marketing grades for legumes, legume-grass mixtures, and grasses – American Forage & Grass Council, Hay Marketing Task Force. Almost everything can affect forage quality in one way or another. Soil moisture and soil fertility while the forage is growing are important. Generally, the better the growing conditions, the higher the forage quality. With good growing conditions, the most important factor affecting forage quality is growth stage at harvest. More mature forage is less nutritious. Older plants generally have a lower proportion of leaves and a higher proportion of stem material (highly indigestible fiber). Young tender stems, leaves and flowers provide the highest quality forage. The general relationship between forage maturity and the four quality estimators is illustrated in Table 2. As maturity advances, crude protein and RFV generally decrease, and ADF and NDF increase. Forage producers and users recognize that quality does not improve after harvesting. The harvesting process can, however, reduce forage quality. For example, leaf loss caused by rain or excessive raking lowers forage quality. Baling hay too wet can cause excessive heating and mold to develop. Forage quality can also be reduced during storage. Uncovered hay stored outside loses nutrients by the leaching action of rain. When hay becomes wet (from rain or absorbing moisture from the soil) it can rot, even though it was dry when baled (Extension Fact Sheet BAE-1716: Round Hay Bale Storage). In summary, high-quality forage is the end product of good growing conditions, correct harvest timing and proper handling and storage from harvesting to utilization. Table 2. As alfalfa maturity advances, crude protein and RFV generally decrease, and ADF and NDF increase.